You have guests coming over soon for the holidays, and you are trying to make sure that everything is in order. This is a complicated task, and it requires special attention to the kitchen. When your guests are looking around for something to eat, you would like to be able to direct them to a beautiful pantry that makes food a snap to find. With these pantry organization tips, your pantry will look like a beacon of neatness for you, your family and your guests. Before you can set your pantry up for your guests, you need to take an inventory of what you have, what you need and what really belongs in your pantry. Many people get into the habit of tossing everything in the kitchen that does not have its own place into the pantry. For an organized system, you must first decide what you would like to keep in there. Sort out the items that do not belong and find another place in the kitchen or another room for them. This allows you to design your pantry in a way that really works for you. Remember the days when you would open a cupboard and food would fall out? Bid them farewell, because you are going to turn your pantry into a positive space in your kitchen. If you frequently struggle with keeping your pantry organized, ask yourself some honest questions about how you want to use the pantry. You do not have to keep your cereals on a specific shelf just because your friends and neighbors do. Make it easy to find things, with a layout that makes you happy and minimizes confusion. A few cabinets that came with your Atlanta home do not necessarily make a great pantry. You deserve something that is perfectly designed for your home, but also for you. For the best usage of your pantry, consider custom pantry cabinets. Custom cabinets give you drawers, cupboards, shelves and racks right where you want them. 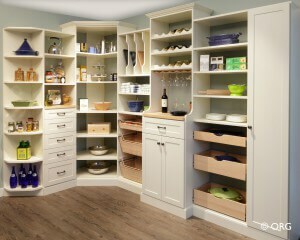 Corner shelves maximize the available space in your pantry, while drawers make short work of using deep pantry cabinets. This way, your guests can reach what they need without having to dive or dig. There is not much time left before the holidays arrive and your guests do, too. Before things get really crazy, follow these tips to eliminate clutter out of your pantry and make your storage do a better job. When you want your pantry to make your kitchen a more enjoyable place to be, contact us for a free Atlanta pantry cabinet installation quote. We have pantry designs and cabinets that you will love.